Select your resort - This is another fun step! Often, couples will fall in love with a resort that they've read about and choose it, regardless of it's location. There are many things to consider when selecting the resort... Do you want it to be for adults only, or family friendly? Do you want it to be all-inclusive (highly recommended!) or close to the airport? You can be confident in our resort recommendations, knowing that we will only offer resorts with proven track records. Remember, we've been to many of these resorts and destinations and you can rely on our experience. 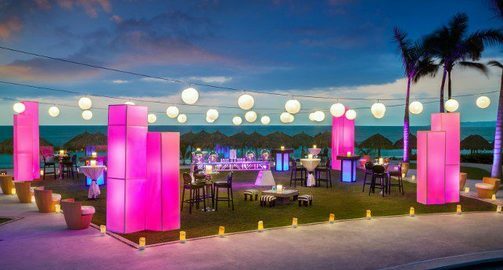 Confirm your wedding date with the resort - Destination weddings take place every day of the week, so finding an available date is not usually a problem if you have some flexibility. The more set you are on a particular date, the earlier you should begin planning. Make your room reservation - As soon as your wedding date is confirmed with the resort, we will book your room. This seals your plans, giving you the assurance that you in fact are going to have a destination wedding! You can take a deep breath and relax knowing that the major decision making is done. Send Save The Date invitations - Usually couples will send a Save The Date invitation as soon as their wedding date and location are confirmed. You can choose anything from a Save The Date email to refrigerator magnets to a formal printed postcard. Some couples design a monogram or logo for their wedding. We include a custom wedding website for you free of charge. The possibilities are endless! Since we take on the task of travel planning for your guests, you'll want to include the contact information for Shelli's Travel so your guests know who is handling their room reservations. We will customize each guests' travel arrangements to fit their specific needs. Shop for your dress - If you haven't already done so, now is the time! Remember that you'll want to carry your wedding dress with you while you travel. It will be one of your carry-ons for the flight. Destination wedding dresses come in all styles from beachy sundresses to formal gowns. Whatever you choose, it will reflect your personality and style. Happy shopping! Check your passport - If you already have a passport, make sure it will be valid for at least 6 months after you plan to travel for your destination wedding. If you don't have a passport yet, you'll want to apply for one now. Also, when making your travel reservations, make sure the name on your passport is what you give for the name on your travel documents. Talk it up! - A lot of guests have probably booked their travel by now, but some will wait until your wedding date draws nearer. Keep talking to your family and friends about your wedding. Don't be afraid to show them your excitement! Usually guests only need a small deposit to lock in their travel reservations. Sharing this with them early and often will motivate them to confirm their trip. We are more than willing to send a note to your guests inviting them to book. It is sometimes nice to get a reminder from someone other than the bride and groom. Finalize the details - The details of your ceremony and reception will start to really take shape. You will be making decisions on things like flowers, menus, music, and decorations. You will also make a contingency plan in case of inclement weather. Resorts have a wedding coordinator on site that we will work with to plan the fine details of your wedding day. Finalize legal documents - Make sure you have all of the legal documents in order that are required for you to be married. Do you need notarized copies of anything? Do you need anything translated? We will help you with these details early on, but should have everything ready to go at least 2 months prior. Send formal invitations - Many couples choose to send a formal invitation to their guests. You may be having a reception at home after your destination wedding. 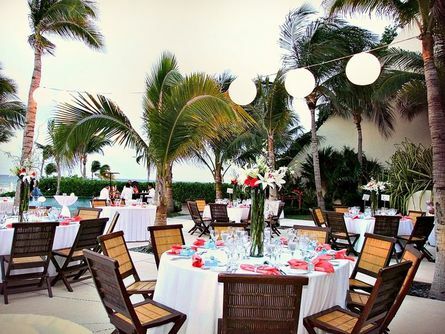 In this case, you can announce your destination wedding and invite guests to your reception. Again, you'll want to include your website and our contact information so last minute wedding guests can easily make their travel arrangements. Final payment - travel arrangements usually need to be paid in full 45-70 days prior to your departure date. Finalize everything - All of the details for your wedding ceremony and reception should be finalized. You should begin a packing list so you don't forget anything important when you leave for the airport. Prepare to travel - Make sure you have held your mail at the post office, set up an out-of-office auto reply for your email at work and home, and have given key people your travel itinerary. Make copies of your passports to keep in each piece of luggage just in case. Double check that you have all legal marriage documents in your carry-on. Bon Voyage!!! Now go get married!